So you’ve decided that you need an extra space to entertain company. Many homeowners choose their basement as the perfect location for their new rec room. Once the location is settled, the decision of what should be included in the room must be established before the construction can begin. Do you want an air hockey table, a pool table, a rock climbing area, a bar, and or theater seating in your new basement remodel? What you put into your rec room determines your layout and of course your budget. If the basement is the location it is important to make sure a sump pump and drains are installed in case of flooding. While most people choose drywall for the walls in their basement remodel, some people choose a drop ceiling as opposed to a sheetrocked ceiling as it allows them to have access to the plumbing and wiring. Drop ceiling are great for ease of accessibility, however the down side is they don’t have the higher-end finished look. If you are looking for a something a bit more unique, wood makes beautiful ceilings and can be trimmed out in a variety of options making it versatile to meet the needs and styles of many homes. 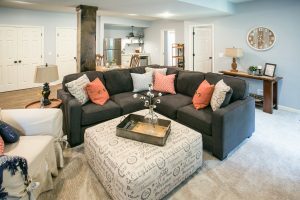 When it comes to basement remodels there are many options for the flooring and again the question is who and how do you plan to entertain. Most of our clients prefer carpet in the basement, however, there are so many options in flooring, it would be shame to not at least consider some alternatives. Tile comes in many colors, types, and patterns; the possibilities are endless. Floating wood floors or commercial flooring types are also an option. If you have a swank area with custom bar and a private wine room, a luxury carpet or travertine tile would be in order. If you have a house of rowdy teenagers, tile or commercial flooring is probably going to hold up better than carpet or hardwood floors. If you are set on hardwood floors, but are afraid they won’t hold up to the beating in a rec room, consider installing ceramic tiles that look like hardwood. These tiles look so much like hardwood, most clients do a double take. Slate tiles come in a variety of patterns and are beautiful with a high gloss, which gives it a wet look. The only flooring I recommend to stay away from, especially if you have young children, is berber carpet. If a thread of berber gets pulled, it will be a hideous run in rug. If you are looking for a short fibered carpet similar to berber, there are several on the market that are suitable substitutes. If you are considering a kitchen or bar in your basement remodel, but are not wanting to install it at the time of the original finish, it is important to have your contractor or plumber stub in for all the plumbing you will want in the future. This will save you money… a lot of money. When it comes to your bar or kitchenette, location and size are the first components to consider. These two decisions will be key in pricing. It is important to realize that if you are installing a sink, the drains and supply lines must be run to the desired location, which if not close to already stubbed in areas, will cost extra to jack hammer the concrete floors in order to tie into the existing drain lines. After size and location are determined, the fun of choosing cabinetry finishes, countertops, and backsplash begin. One only has to search Pinterest to view the vast array of options in these categories. I prefer my clients to tag me on Pinterest designs that they like best so I can provide a similar selection. As with any space you choose to remodel the finishes will determine your final cost. At Absolute Building Concepts, we work with each of our customers to provide a quality project at a reasonable price. Our contractors have been serving the Kansas City area for decades. Give us a call 816-650-6000.